In Part I of this story, we learned about Jacob and Lina Hecht and how Lina leveraged her social prominence to establish educational, health, and job-training programs for needy Jews in late 19th-century Boston. In Part II, we learn how Lina improved those lives even further through more charitable programs that taught self-sufficiency and served as a model for the work performed by JF&CS today. Mrs. Lina Hecht worked with her husband throughout the 1870’s and 1880’s to professionalize the United Hebrew Benevolent Association (UHBA) to ensure uniform and evenly distributed services to the Jewish poor of Boston. In 1895, the UHBA merged with Mrs. Hecht’s Hebrew Ladies Sewing Circle, as well as the Free Employment Bureau, the Charitable Burial Association, and the Leopold Morse Home for the Aged and Infirm Hebrews and Orphanage, to form the Federation of Jewish Charities of Boston. Mrs. Hecht organized the fundraisers that made the merger financially possible and was one of only three women appointed to its founding board2 Thirteen years later, in 1908, Mrs. Hecht became the first woman vice president of the Federated Jewish Charities. 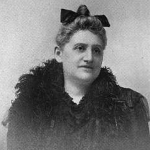 She was also the only female mentioned in Israelites in Boston, a publication of short biographies by Rabbi Solomon Schindler, published in 1889. By 1889, Mrs. Hecht had started a Jewish Sunday School for immigrant children, hoping to teach them both the basics of Judaism and the American way of life. Mrs. Hecht believed that the progress of the world “rests upon the breath of the school-children and that they in turn influence the parents.” Along with pioneering social activist Golde Bamber, she expanded the school in 1890 to become the Hebrew Industrial School for Girls (HIS), located in Boston’s North End. The school’s primary purpose was to educate young female immigrants in a trade (particularly sewing, tailoring, millinery, and cooking) so that they could provide for themselves in their new country. Mrs. Hecht even went as far as presenting the plan for her school to the Baronesses Rothschild and de Hirsch in Paris and successfully obtained their generous contributions to fund the school.